The Animated Nativity DVD FREE! while supplies last! 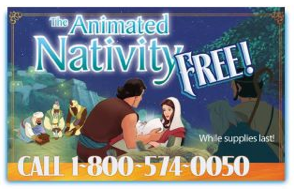 Hurry and you can get The Animated Nativity DVD FREE from The Living Scriptures! Call 1-800-574-0050 and use code FKB. One per household, while supplies last! There is also FREE shipping! I have this DVD and we all love it! It's a great one to watch every year! !